After a much needed “golden slumber”, I started Saturday off in the best way possible… with a hot shower. Even though we were seriously rationing the water and it was the quickest shower I’ve taken in my life… it felt absolutely wonderful to rid myself of the Bonnaroo grime and emerge from the RV so fresh and so clean. Oh the little things! As everyone around our camp began to surface and prepare for Day 3, my parents decided to brave the hoards of Bonnaroovians and head into town to fill up on gas for the generator and pick up a few supplies to keep us going through Sunday. My sister and I opted to head up to Centeroo together, far more exciting than supply shopping. Our first stop was to check out the merchandise tent. Not only did they have the official Bonnaroo swag, but a fair amount of the artists were also selling their merch as well. I had to talk myself out of several purchases, but did end up with a pretty sweet screen-printed festival poster and my sister went for the rather patriotic festival tank top. With our mementos in hand we headed over to Which Stage to catch Solange. 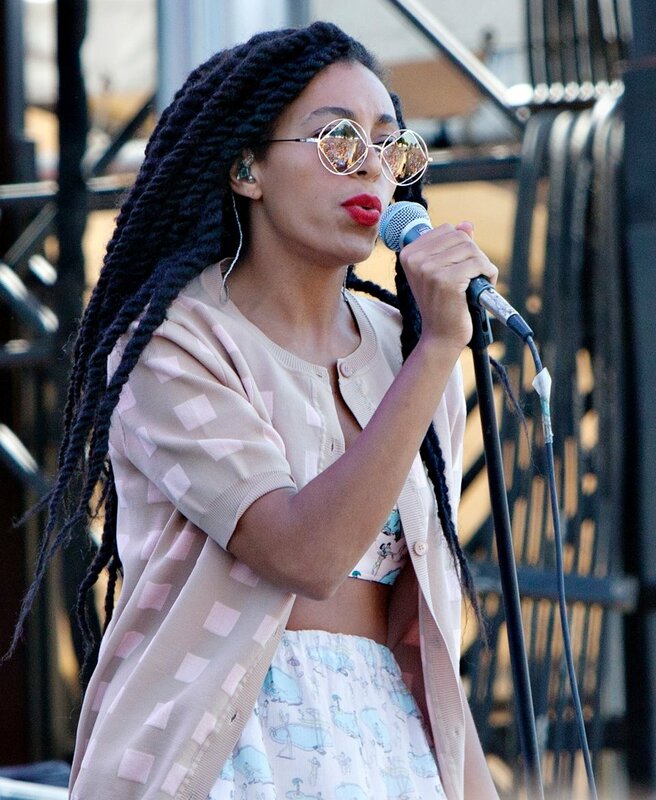 Houston native, Solange Knowles (yes, her sister is Beyonce Knowles) looked to be as fashionable as ever when she took to the stage on Saturday. Rocking some leopard print heels and a pair of sunglasses that Janis Joplin would be envious of, Solange made sure to not only leave a lasting impression with her looks, but her voice as well. Singing a majority of songs off of her True EP, she managed to throw in my favorite ditty, a cover of the Dirty Projectors “Stillness is the Move” and crowd favorite “Losing You”. Her sound is almost 90’s-esque and took me back to the days of blasting my sweet boom box with the likes of En Vogue, TLC, and Salt-N-Pepa. The dream of the 90’s is alive in Portland…errrr Manchester. Speaking of Portland, Portugal. The Man who happens to call Portland home was up after Solange on Which Stage. 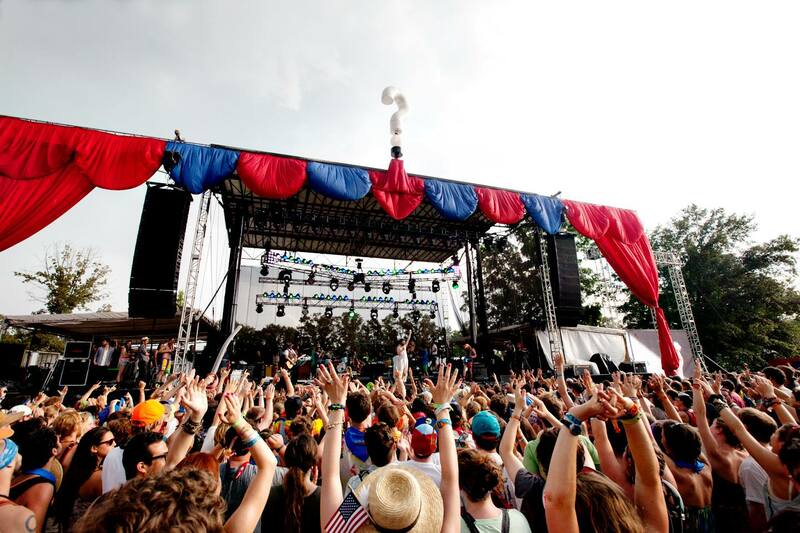 Having officially graduated from a tent to the 2nd largest stage at Bonnaroo, the band of boys (and a gal) took full advantage of having a larger crowd. They played primarily tunes from their new release Evil Friends, but threw in a few fun tunes such as “Day Man” from It’s Always Sunny in Philadelphia and “So American” featuring “Weird Al” Yankovic on accordion. “People Say” was played and this guy next to me (wearing a neon speedo and cowboy hat) grabbed my arm and started belting it out word for word to me…quite the interesting serenade! Perhaps still reeling from the mind-blowing Paul McCartney set the night before, Portugal. The Man chose to melt faces with their rendition of “Helter Skelter”. They also went for a little “Hey Jude” during their last song, “Sleep Forever”. I will never tire of hearing Beatles cover songs, so thanks guys (and gal)! My sister decided to go venture out on her own while I held down the fort at Which Stage. 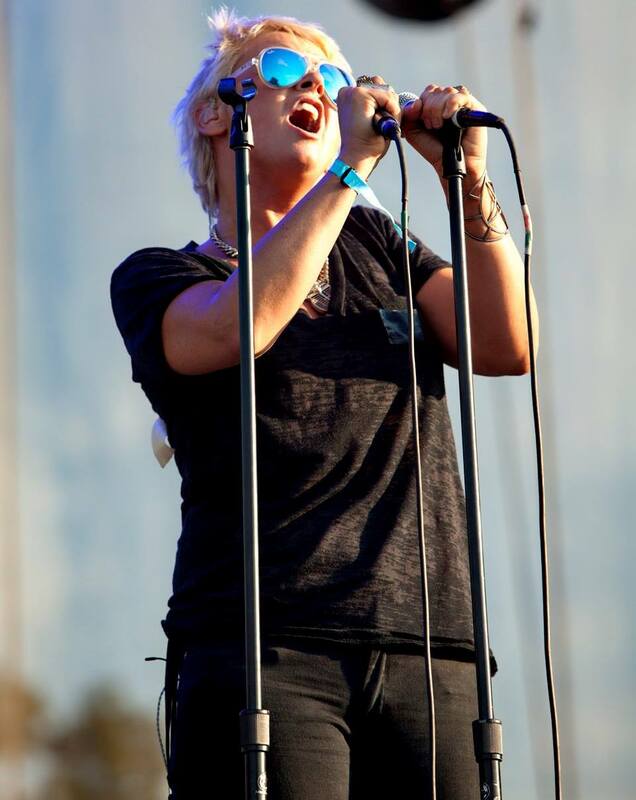 Next up was Cat Power. I had the opportunity to catch her the first year I covered Bonnaroo for the Grateful Web. Long brown hair with a bit of anxiety and innocence, Chan Marshall blew me away with her haunting vocals and oddly amusing stage presence. I was looking forward to seeing her again. This time when she made her way to the microphone I almost didn’t recognize her. Her hair was now cut super short and platinum blonde, but the familiar stage antics and voice that takes your breath away still remain. Financial woes and health problems aside, this woman can sing. She opened with “The Greatest" and “Metal Heart”; “Cherokee”, and “Ruin” gave me goose bumps. She played a good mix of newer and older tunes, all while hydrating the crowd by throwing bottles of water off stage during “I Don’t Blame You”. Despite it almost being painful to watch her flit around the stage and tinker with things while she should be singing, it’s all party of the quirkiness that is Chan Marshall. With a voice like hers… she can do anything on stage that she damn well pleases and I’ll still come to have a look and a listen. As Cat Power’s set was coming to a close, across the park Beach House and Dwight Yoakam were just getting started. I’ve had the pleasure of seeing Beach House multiple times before so I opted to let them be my soundtrack while traveling through Centeroo on my way to see Dwight Yoakam. It was going to be a rather brief stop at the country legend’s stage, but it was good nonetheless. I walked up to a packed tent and “Little Sister” (one of my favorite Elvis tunes) being played. There was also quite a bit of sparkle and glitz on stage, almost that of a Toddlers and Tiaras pageant. I wasn’t able to make it that far in, but the crowd was definitely enjoying themselves. D-wight still has it! After my brief country encounter, I hustled on back towards Which Stage. With a pit line and crowd that rivaled Sir Paul McCartney’s, The Lumineers were clearly one of the highly anticipated newer acts to see this year. I was beyond excited. I had not yet had an opportunity to catch them live before so being front row had me all smiles. 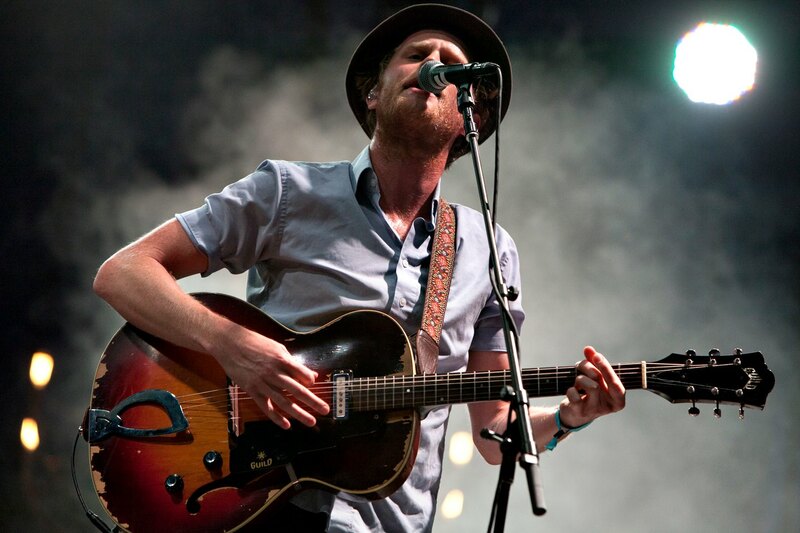 As the sun sank into the Tennessee soil, The Lumineers opened with “Submarines”. They followed that up with a Sawmill Joe song and then “Flowers in Your Hair”. Everyone in my vicinity knew every word to every song, and “Ho Hey” was no exception. Lead singer Wesley Schultz requested that everyone put down his or her cameras and phones just to be in the moment and sing along, I happily obliged and rested my behemoth on the gate. 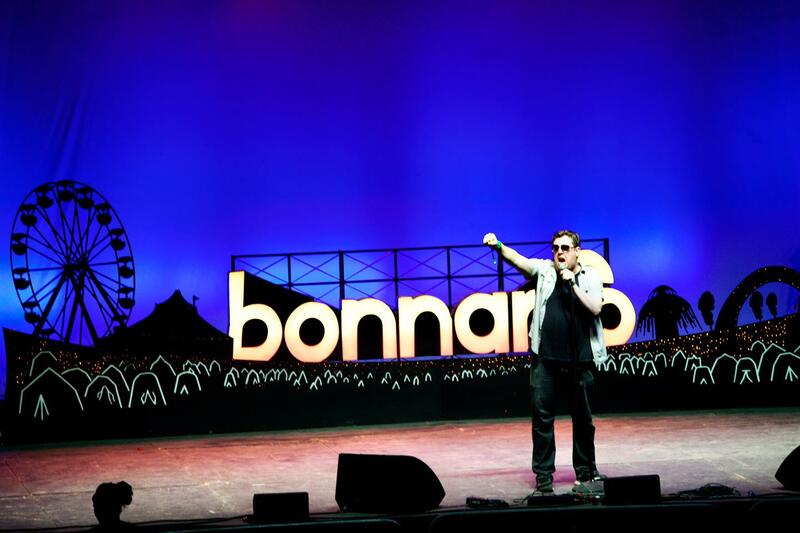 After the massive crowd sing-a-long, Wesley made mention that he was at the first and second Bonnaroo so playing at Bonnaroo this year was very special to him. He did note that the first two years he wasn’t playing, rather watching them… or something. They played a great cover of Bob Dylan’s “Subterranean Homesick Blues” and also previewed a new song “Falling”. The band also hopped off stage and ended up on a smaller stage out in the crowd for a few tunes. When they made their way back to Which Stage they ended their set with a cover of the Violent Femmes “American Music” and their own tune “Big Parade”. As the pit was clearing out I tried making my way through the press area to the main stage, which was already surprisingly packed. I almost wondered if people hadn’t gotten the memo that Mumford and Sons weren’t playing due to bassist Ted Dwayne’s recent brain surgery. Perhaps they were legitimate Jack Johnson fans or they were just too stoned to go anywhere else and decided to park it in the biggest open field at the ‘roo near a plethora of food vendors. Earlier in the day I had received a press release that had a statement from Jack Johnson. 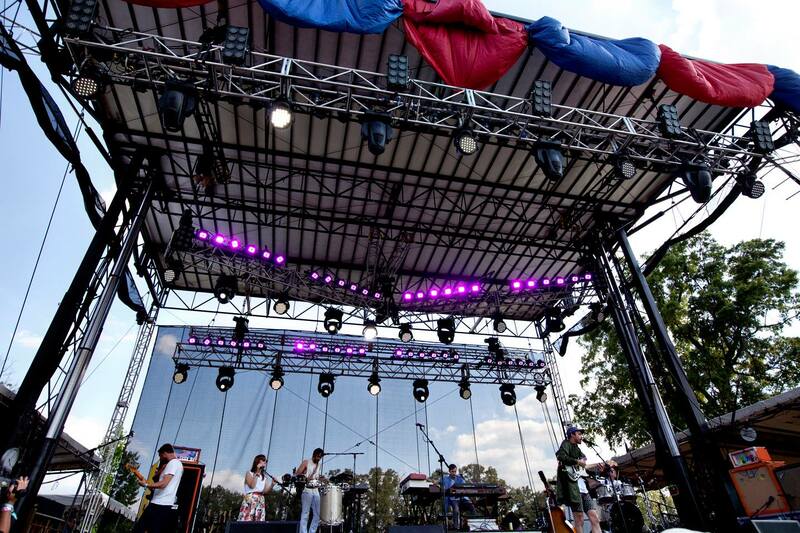 He was only supposed to be coming to Bonnaroo to sit in with his friends from ALO, but in light of the health issues that curbed Ted Dwayne, Jack was asked very last minute to fill their headlining spot. He admittedly said that he was rusty and would have to try and re-learn his songs, not something most of us wanted to hear, but given the circumstances, we were willing to give Jack a chance. He’s played What Stage in years prior, so essentially this was going to be like getting on a bike and just riding it. He played a few of his better-known tunes such as “Taylor”, “Upside Down”, “Bubble Toes” and “Flake”. There were also quite a few covers from Sublime to Bob Marley to the Steve Miller Band. He also made sure that the crowd got a little Mumford by covering their hit song “The Cave”. The night was ended with “Mudfootball” and the Preservation Hall Jazz Band accompanied him on stage. I will give Jack credit, given the minimal time he had to prepare he still pulled off a solid set of tunes trying to appease a varying crowd. Even though he wasn’t exactly what they came to the festival to hear, he brought back the nostalgia of Bonnaroo’s past and reminded me of the type of tunes that this festival has been known for. Opting to by-pass the Which Stage and R. Kelly in a cherry picker (hopefully not peeing on anyone), I decided I was going to live out my love for the 80’s and see Billy Idol. I managed to convince my parents to forgo sleep and come see the late night set with me. We headed over to That Tent and luckily got fairly close to the stage. After what seemed like an eternity to get his gear set, Billy “F*cking” Idol reminded us that the wait was well worth it by opening with “Dancing with Myself”. There was no shortage of theatrics, outfit changes (Billy was a little sweaty), and song after song to bring me back to my youth. “Flesh for Fantasy”, “Cradle of Love” and “Eyes Without a Face” made way for a fantastic cover of The Doors “LA Woman” which Billy charmingly changed to “Bonnaroo Woman”. Steve Stevens was phenomenal and even teased the crowd with a little Led Zeppelin. Who doesn’t like to hear “Stairway to Heaven”? Mr. Idol also decided to shower his audience with gifts. He threw out autographed drumsticks, paper plates, t-shirts, and set lists. My father happened to snag a Steve Stevens guitar pick! For how high energy his show was, I felt like Billy should have been on a bigger stage. It might have made things a little less sweaty and allowed for a bigger mosh pit. 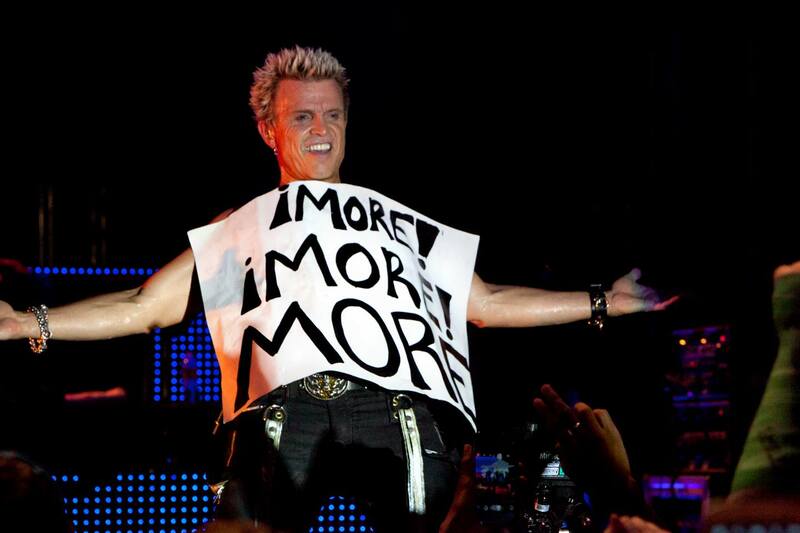 He wrapped up the evening with “Rebel Yell” and an encore of “White Wedding” and “Monie Monie”. Another aging rock star that proved he’s still got it and he’s still Billy “F*cking” Idol! The last day of Bonnaroo is always bittersweet. Most are pretty exhausted after a long weekend of partying and rocking out and look forward to a real shower and bed. Some dread returning to reality and having to pack up and leave the farm they have called home for the past 4 days and want to stay just a little bit longer. I find myself with the latter. It was great being able to spend the weekend with my family (which is a rarity anymore as we are spread out in different states) and share in the experience that is Bonnaroo, but man oh man I did not want to go home. Can I just stay there forever? Build a small house on the farm? I'll take real good care of it… I promise! Oh, wishful thinking. My first stop of the day was going to be at What Stage for Macklemore & Ryan Lewis. I had the urge to pop some tags and couldn’t resist seeing the Seattle based duo in the flesh. Ben Haggerty, better known by his stage name Macklemore, has been receiving all sorts of buzz from the hip-hop community since the release of his debut album The Heist. He opened his set with “Ten Thousand Hours” and “Crew Cuts”. He also threw his hit “Thrift Shop” out fairly early, but perhaps because he was given a fur coat that he so cleverly dubbed a “Tennessee Bobcat” he felt it was the right moment to bust it out. He followed that song with another popular hit “Same Love” which is nod to LGBT rights and equality. Mackelmore asked the crowd to put one finger up if they believed in equality and everyone did. He made mention that in that moment, that was the most single fingers he’s seen in the air at any of his shows. It surely was a sobering visual representation as to how many people don’t define others by their sexual orientation or whom they can or cannot love. One love, people. 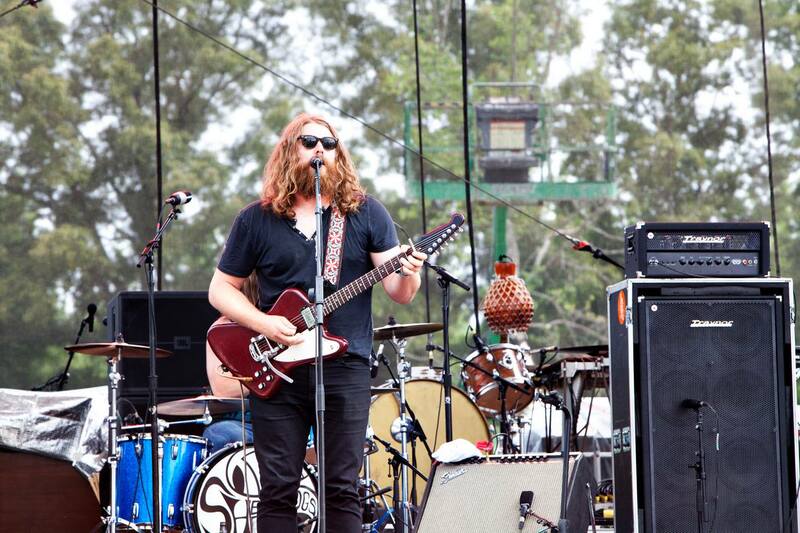 After leaving What Stage on an uplifting note, I headed over to Which Stage to catch the Sheepdogs. 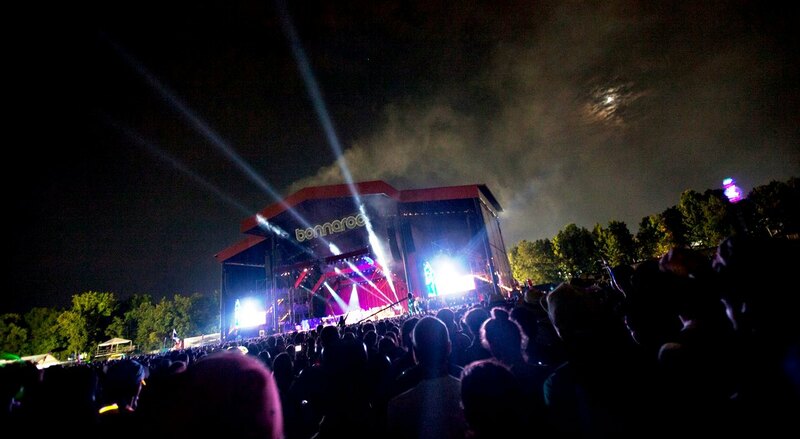 In 2011 they made their debut at Bonnaroo as part of the Rolling Stone contest “Choose The Cover”. They beat out 15 bands to be the only unsigned act to grace the cover of the highly popular music culture magazine. Proving they have staying power, the boys from Saskatchewan brought the noise. Steeped in rock n’ roll with a touch of the blues, you’d think you were listening to a band straight out of the 60’s and 70’s, with the hair to match! The Black Keys’ drummer, Patrick Carney, produced their latest self-titled album on Atlantic Records. They played a few songs from that album and some of their earlier ventures. I was quite pleased to hear two of my favorites, “Javelina!” and “The Way It Is”. They ended their set with “How Late, How Long” and I grooved all the way from Which Stage to the Comedy Tent. It was time to see Danny Tanner, uh, I mean Bob Saget. The Comedy Tent was quite packed and it looked as though the whispers of Bob Saget’s raunchy routines made this the hot ticket of the day. I’m sure the air-conditioning helped too. Getting off to a late start, comedian Jared Logan came out and asked all the Bonnaroovians “Did anyone get laid this weekend?” Everyone cheered to which he remarked, “You guys are liars!” He continued on with a slightly offensive, but rather hilarious set. Then came out The Improvisational Shakespeare Company. Men in tights, pretty much sums it up. I kept checking the time hoping that they would end soon and good ole’ Bob would get on stage, but alas I had to jet before I could see him and relive the America’s Funniest Videos days with his horribly awkard jokes. 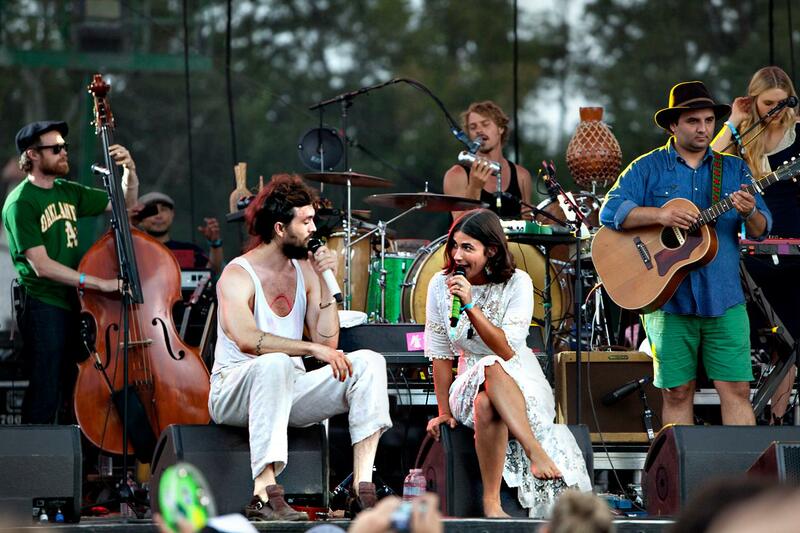 I had to see Edward Sharpe and The Magnetic Zeroes. Lead singers with glorious beards trump Bob Saget any day! Without a legit set list, front man Alexander Ebert hopped on stage and asked the crowd “What do you want to hear?” They opened with “40 Day Dream” and quickly followed with “That’s What’s Up” and another popular tune “Janglin’”. As he typically does, Alexander hopped off stage and planted himself on the gates near the crowd and even climbed into the audience for a song. I was fortunate enough to be standing just off to the left side of the pit when he decided to come on over and put himself all of like 8 feet from me. A photographer’s dream come true! Or at least mine. Throughout their set he was joking and messing with those who may have been tripping. They also played their biggest hit “Home” and called for the audience to tell their stories. At one point, Alexander brought a gentleman on stage that had received a transplant thanks to an anonymous donor and it saved his life. What a great place to be and to be alive! Once the set ended, the stage cleared and then Alexander came back out with a mic and speaker in hand to announce that they were going to lead a parade around farm. Too bad I had my heart on seeing David Byrne, otherwise like a bug to a flame… I would have followed. I had not seen the likes of St. Vincent a.k.a. Annie Clark since her days with the Polyphonic Spree so to see her now with one of my top 20 favorite musicians of all time was a real treat. In recent months prior to Bonnaroo their album Love This Giant had been on heavy rotation for my office mix. When the newly blonde St. Vincent (she must have been having a girls night with Chan Marshall and a bottle of peroxide) and the glowing white haired David Byrne opened with “Who” I nearly squealed with delight. Their quirky choreography and enthusiastic backing brass band made for an interesting show. As expected, there were plenty of Talking Heads hits played. My favorite song made the set list “This Must Be The Place” and I must have snap-chatted my friends’ video from it about 20 times. They ended their set with “Burning Down the House” which was great until they came back and did the encore, which wrapped things up with “Road to Nowhere”. 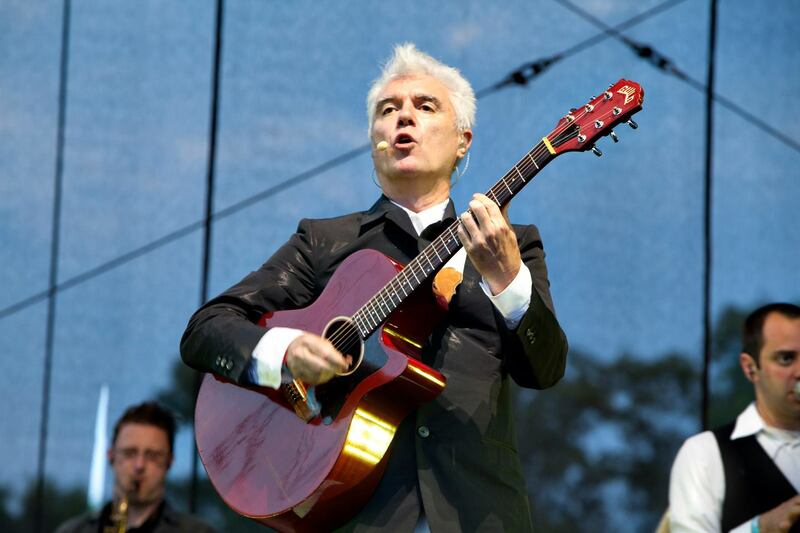 Having seen David Byrne solo the last time he played Bonnaroo it was nice to see him with St. Vincent, even if he did rock a very Colonel Sanders-esque outfit. Their voices are quite complimentary and I would like to see them collaborate again in the future. The skies grew rather dark as I made my way back to What Stage in search of my family. It looked like a storm was brewing and I was not certain how Tom Petty would fair if the weather turned nasty. I located my mom and dad who were also joined by my sister. Having been a veteran of these outdoor music festivals, I tend to pack adequate gear for various weather scenarios. My family on the other hand was ill prepared. As the rain began to fall I pulled out a couple ponchos, umbrella, and raingear for my camera. Passed them out to my parental units and sister. I opted to just stand in the cool rain; it felt wonderful on my sunburn! 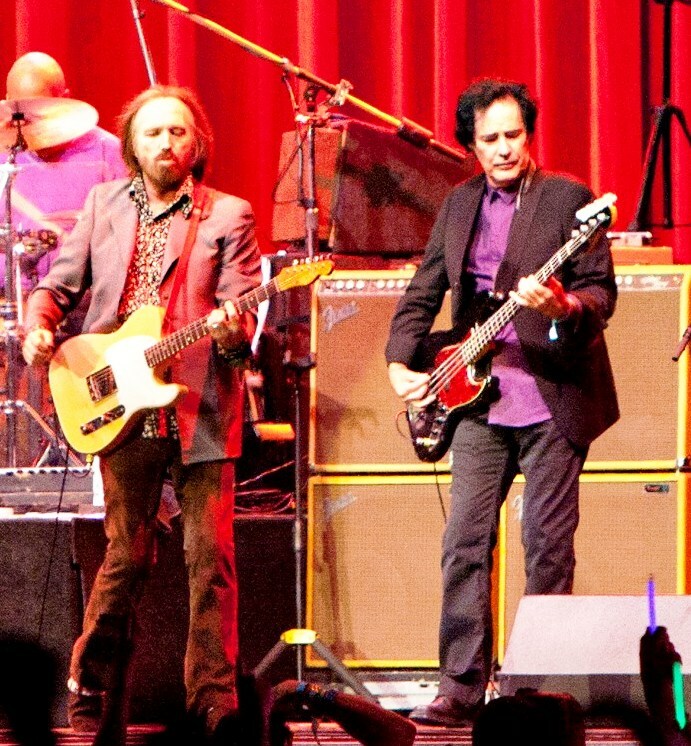 Once Tom Petty and the Heartbreakers took the stage the rain did start to let up and would eventually dissipate. Choosing to open with a cover rather than a tune of his own, Petty belted out “So You Want to Be a Rock n’Roll Star” by The Byrds. No one really knew what to expect from this set. On his current tour he’d been playing a lot of B-sides and rarer tracks, deep cuts if you will. I was holding out hope to hear my favorites and that perhaps he’d play some of his more popular hits. Before I knew it he was playing “I Won’t Back Down” and that set promise for the rest of the night. “I predict we are going to have an incredible time tonight, I don’t have to be anywhere for hours… so…” Petty said with a chuckle. He then went on to do a Big Joe Williams cover of “Baby, Please Don’t Go” and later on a cover of the Grateful Dead’s “Friend of the Devil” (which happens to be one of my top 5 favorite Dead songs). A Traveling Wilbury’s tune made the cut and so did a bulk of his greatest hits. My mom, dad, sister, and I were all singing along with “Mary Jane’s Last Dance”, “Free Fallin’”, “Refugee” and “Runnin’ Down a Dream”. Ironically… we did the same thing together many years back. Tom Petty and The Hearbreakers was the first concert my parents took us to see as wee ones. It was nice to essentially come full circle and share this moment with my family again. The encore consisted of my all time favorite Tom Petty song, “Don’t Come Around Here No More”, mainly because I loved the video growing up. He also played “You Wreck Me” and he ended the night with a classic, “American Girl”. As the field began to clear and weary festival goers made the trek back to camp one last time, impromptu sing-a-longs helped to pass the time as we were herded like cattle under the Bonnaroo arch. A little “Bohemian Rhapsody” makes the long walk much more bearable! Back to the campsite we said our goodnights and goodbyes to the neighbors. Most of us were plotting an early escape to beat the traffic. My 30th birthday at Bonnaroo was a great success. My sister made her shuttle and was on her way back to Washington D.C. My mom, dad, and I were packed up and ready to get the RV out of our site in preparation to head back to Illinois. Before we even got on the road, I pulled out my phone and set a reminder that read “Family vacation 2014 - Bonnaroo”.